More “Summer in the City” Celebrations! Check out the photos from last week’s “Summer in the City” concert, featuring the talents of Jimmy Jorge and the Latin Express! 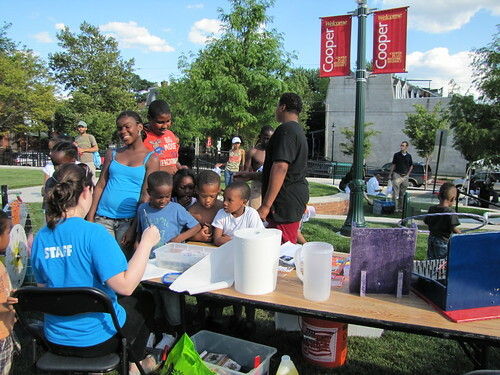 Children and adults alike had a grand time at the July 21 “Summer in the City” concert, featuring the talents of the Camden-based Sensational Universal African Dance and Drum Ensemble! Photos from First Summer In the City Concert Have Arrived! Due to an excessive amount of water in the Cooper Commons Park, today’s “Summer in the City” concert has been cancelled for today at 5:30 p.m. but will be rescheduled at a later date. Besides a beautiful day, the organizers of the Peggy Spiegler Melanoma Research Foundation were grateful for the more than 270 registrants that participated in the “Talk While You Walk/5K Run For Peggy Spiegler” fundraiser on June 25. Planning will soon be underway for the 2011 Pink Roses/Teal Magnolias brunch to celebrate the breast and gynecologic cancer programs at Cooper University Hospital. The Cherry Hill, NJ-based Peggy Spiegler Melanoma Research Foundation will host its second annual “Shredding on Sunday at ShopRite” event to raise funds for the Foundation. A portion of the proceeds will benefit the Cooper Cancer Institute. Three very special events will help Cooper celebrate the holidays in the community this year, as part of the Cooper Lanning Holiday Festival on December 3.